Support isn’t just “noise on a spreadsheet”! The current UK climate is focused on austerity and efficiency and where government spending seems to be channelled to the preservation of frontline staff across a number of public services the value of support roles is coming under increasing scrutiny . This is especially true in academia, where students will want to see value for money, and where research funding is increasingly focused on outcomes and impact. Preservation of frontline staff in these areas will be seen as key to an institution’s success. Across public sector bodies we see an emphasis on cutting staff that are grouped under labels such as back office, managers or support. On paper, or more realistically spreadsheets, cutting out these staff frees up funding to keep police officers on the beat, nurses at the bedside or teachers at the chalkface. But the reality is of course that each time a function of administration is taken away from support staff, those at the frontline need to do it themselves. Before making broad based economic assumptions academic institutions need to scratch below the surface and reflect what is needed to ensure that frontline academics can keep doing the roles they are good at, innovative teaching, cutting-edge research, and engaging with students. The Building Capacity Programme sought to work with senior managers in HEIs to address key areas of concern across either research, teaching and learning or enterprise by deploying available resources from the JISC catalogue. Examples include enhancements to research supervision, small business engagement and assessment of students. The majority of projects within the programme have made a significant impact in their host institutions, creating enhancements and efficiencies to practice. But what are some of the key characteristics of these successful projects? identification of issue > validation of issue > literature review of existing cases and available solutions > piloting of solution > review > wider deployment of the resource within the institution. Senior sponsorship, the most successful projects were actively led, or engaged with, senior institutional managers (mostly at pro vice chancellor, and occasionally deputy vice chancellor level). Linked to strategy, where projects allowed institutions to deliver their key strategic aims in efficient and effective ways. As these were owned by the senior manger the projects were embedded, supported and kept within scope at all stages. Delivered by support staff, these projects were mostly taken on by the back office, or support staff. Arguably the most important of the tasks was the literature review, this provided two key success elements. Firstly it identified a catalogue of solutions for institutions to choose and contextualise from, secondly, a literature review demonstrated to frontline staff that the support staff used as much rigour in their practice as themselves. This last characteristic is the point of the post. Popular politics and media would have us believe that public bodies are pyramid shaped, with the apex being the frontline staff, a nurse, a policeman, a teacher, a researcher. Subsequent ever enlarging layers are made up of administration, support, management and so on. 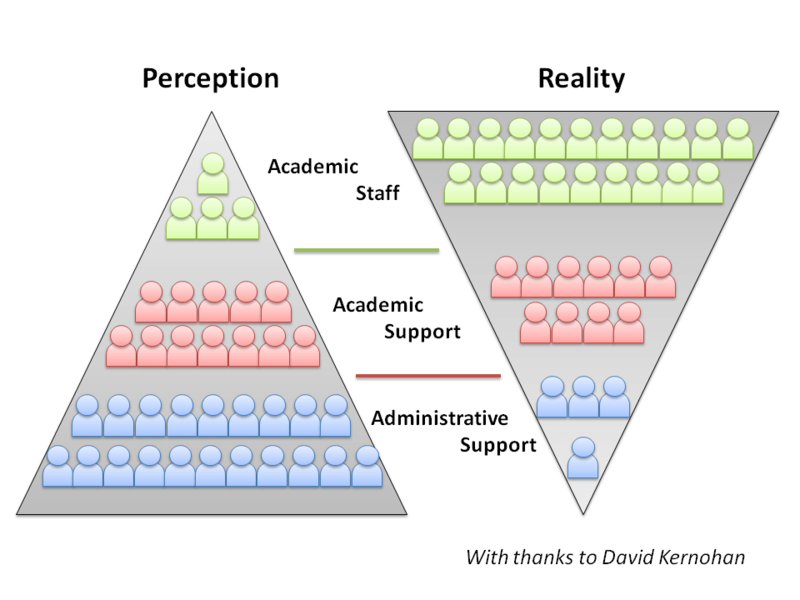 But the reality of higher education, as we all know, is an inverse pyramid. Most often with very limited support layers to keep the frontline at the top. These support roles across both research and teaching are essential in supporting academics, ensuring that they are able to make best use of learning from the wider sector. The reality of their absence from institutions would be a large increase in an academics overhead in keeping up to date and learning new developments, professional practices and a host of other services. Keeping frontline staff but cutting their support may be exponentially more expensive in the long term than other measures. Douglas Adams observed in the Restaurant At The End of the Universe, a planet that exiled its entire population of telephone sanitisers off-world as they supposedly weren’t contributing meaningfully to society ended up being wiped out by a particularly virulent disease contracted from a dirty telephone. The success of the projects in the Building Capacity programme is largely due to engagement of frontline staff, but this would not have happened unless support staff facilitated the change and ensured the successful enhancement or efficiency. As the programme draws to a close many staff from these support roles have contacted me letting me know that they are being redeployed or made redundant from their current support roles. Sadly, in the current economic climate, it is often support functions that are hit first and hardest. But we need to think through the role of these staff and the part they can play in delivering institutional strategy, efficiencies, enhancements and freeing up time for frontline staff. change management, ICT, management, Project, Uncategorized. permalink. This is all well and fine when money is around. But the new reality is that academics, and not support staff, are what generate money and reputation. In my institution we have the ridiculous situation where some support staff are paid almost as much as academics, and in some instances more than new researchers that we are trying to encourage. Academics are the jewel in an institution’s crown, they need to be preserved and treated well, support staff in places like e-learning and staff development are mostly a luxury that in tough times we should do without.